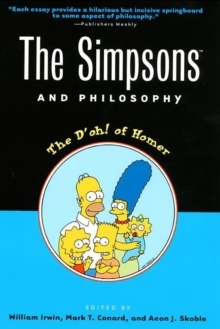 A light-hearted introduction to philosophy through the antics of the Simpsons, television's animated family. These essays on the silly, absurd, hyper-ironic and strangely philosophical world that is Springfield - the town without a state - explore philosophy and the major philosophers of Western thought: is Bart a pragmatist? Why is Mr Burn's quest for happiness continually frustrated? The contributors discuss the thought of key philosophers including Aristotle, Marx, Camus, Sartre, Heidegger and Kant, and tackle issues like irony and the meaning of life, American anti-intellectualism, and existential rebellion. The volume also includes an episode guide and a chronology of philosophers which gives the names and dates of the major thinkers in the history of philosophy, accompanied by a representative quote from each.